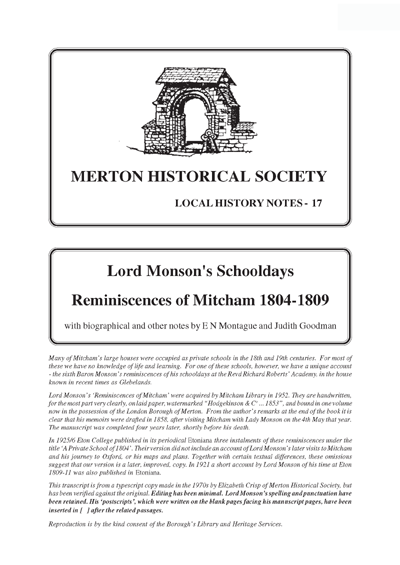 Lord Monson’s ‘Reminiscences of Mitcham’ were acquired by Mitcham Library in 1952. From the author’s remarks at the end of the book it is clear that his memoirs were drafted in 1858, after visiting Mitcham with Lady Monson on the 4th May that year. The manuscript was completed four years later, shortly before his death. This transcript is from a typescript copy made in the 1970s by Elizabeth Crisp of Merton Historical Society, but has been verified against the original. Editing has been minimal. Lord Monson’s spelling and punctuation have been retained. His ‘postscripts’, which were written on the blank pages facing his manuscript pages, have been inserted in [ ] after the related passages. This edition includes 12 pages of biographical and other notes, a 3-page Brief History of Glebelands and a 3-page Index of Persons. known in recent times as Glebelands. clear that his memoirs were drafted in 1858, after visiting Mitcham with Lady Monson on the 4th May that year. The manuscript was completed four years later, shortly before his death. 1809-11 was also published in Etoniana. inserted in [ ] after the related passages. Reproduction is by the kind consent of the Borough’s Library and Heritage Service. had the intention; always procrastinated; and then lost heart. I doubt very much now if I shall persevere. even voices and sounds are more acutely recalled than any that have since struck on my duller hearing. especially with that portion of the road I cannot tell, but so it certainly is. or as I fancy Stainforth made him restore to me a portion of his ill gotten plunder. William John Monson as a small boy. as being “a tale bearer to Mamma”. fellows is increased exactly in an inverse ratio to one’s ability to bear it. I quite shudder now at the thought. The system at Roberts was very peculiar. He had a horror of Ushers. The system at Roberts was very peculiar. punished. Roberts said he did not often flog and comparatively he did not but he caned most furiously. punishment always at hand wherever he might be. of us jostling along behind him and when we had done racing along the garden back to the house. Roberts used therefore to boast we need never be idle but always have some fresh lesson to get ready. liquidate it and then there was a whitewashing act in the shape of a flogging and the boy began again free. exercise enough. In reality there was no pleasure in this. References are to page numbers. Bold numerals indicate main biographical notes; italic numerals indicate illustrations. Glebelands, whilst to the right, incorporated into Little Glebelands, much of the old north-east wing survived. London Archaeology Service (MoLAS) in March 1993, before the building was pulled down. Liberty Middle School added a musical dimension to the proceedings, which were justifiably enjoyed by all. the vicar’s pastoral letters for 1860 – 69, and Mrs.
Rutter was a member of the Ladies’ Visiting Society. I would much rather have been of the party that went to bed. suffered more. Except the allowed beer or milk at meals we never were permitted of right to have drink. us to a severe cross examination. guests, especially a brother Mr William Roberts2 from Eton, used to come out and join our cricket. nor were they allowed to play with us. over”. There were 16 stools each marked with the initials of the owner. I succeeded to the stool of Willm. in 1907. In 1929 Bentley, then licensee of the Ravensbury Arms on Mitcham Common, sold Little Glebelands to Mrs.
bombs jettisoned by a Heinkel 111K flying almost at roof-top height in a northerly direction above London Road. who still remembers very clearly the air raid of 1941. Sir Robert H. Haining, Lord Lieutenant of Surrey, who unveiled a tablet in the dining room to commemorate the event. another phase in the history of Glebelands was about to commence. Council, who also retained 50% of the nomination rights to new tenancies. a John Miles, the owner, was assessed for tax on what was clearly a new house, then occupied by a Charles Douglas. Two years after its first appearance in the tax records the house was either re-let or leased afresh by Miles to the Revd. when it was in the occupation of Richard Hilliard. The household then comprised Hilliard, who was aged about 60.
boys aged between 12 and 17 were resident on census night, three of them born in Ireland, and one in the West Indies. was still listed as a school, run by a Revd. John Hurnall. a large family of nephews and nieces whose mother had died recently. sounds of after life have created such a shudder. preference. He certainly was loved by none of us but still was respected. seventeenth came he was obliged to be put in the room that was reserved if any should be sick. That tuneful instruments impart, Deep silence is the best applause. The concert of your tiny throats; And I will listen to the strain. Mitcham, June 29. S. J. P.
1814 “a copious, and in some degree, a popular writer in prose and verse”. portrait was painted by, among others, Benjamin Haydon. 88 Mrs Hoare (sister of Miss Emma Noel) and presumably a daughter-in-law of Henry Hoare of Mitcham Grove. of ‘dome’ in the sense of house, or domain, originally from domus (Lat.). Secretary Ireland 1835-1841, Lord Lieutenant 1855-8. KG 1855. Succeeded his father as seventh earl 1848. Retired 1859, and died unmarried. A published poet. 93 Henry Richard Charles Wellesley (1804-1884), eldest son of Henry Wellesley, first Baron Cowley. Matriculated at Brasenose College, Oxford 1822 aged 17, and followed a distinguished career as a diplomat. in 1857. KG 1866. Doctor of Civil Law 1870. He died in Albemarle Street. 94 Now known as Figges Marsh. of the Poor of the parish of St George the Martyr, Southwark. action 23rd September 1940, and rebuilt. 99 Tempora mutantur et nos mutamar in illis. Times change and we change with them. 72 Frederick Cuthbert. Younger brother, James, also scholar at Robert’s academy. “Went to Paris” (Monson). [?First son of James Ramsey Cuthbert of Berkeley Square, who matriculated at Brasenose in 1820 aged 19.
philanthropist John Julius Angerstein (1735-1823), who died in 1823 (see Note 49). 75 A l’outrance (Fr.). Se combattre à (l’) outrance (or to fight to outrance) is to fight to the death. V-shaped dip from which dangled a tassel. The boots tapered to a square toe. They were worn with pantaloons. Mitcham, in 1795. She lived there until 1821.
apparently a man of considerable intelligence and character. 80 Imperium in imperio. Rule within rule. varied subject matter than Monson suggests. 84 Samuel Jackson Pratt (1749-1814). His poem was written at Roberts’ academy on 29th June 1813. Summer Tribute to the Birds of MITCHAM BOWER. BY Mr. PRATT. Cuckoos, Nightingales, and Thrushes, All full of song, and eke of feather. of these I will give the following recollections. young. I forget whether the other came to the Baronetcy, I think not. recollection is he was a pleasant good tempered lad. found him a most agreeable highly talented man. stout boy of great strength and rather fond of using it, he became the Baronet and I think is alive now. into the dining room and questioned, the case was too clear and he never returned to Mitcham. body, his friends at school and College raised a monument to his memory in the Chapel of Trinity Coll. West was a curious boy, he was generally dressed in a snuff coloured suit coat waistcoat and trousers. what became of him I know not. I have never met nor heard of him in after life. a smiling stoutset short boy goodnatured but I think left us very soon. Christopher Idle38 did not belye his name. He and Bobby Barlow were the idlest boys in the school. well for they and I slept for a long time in the same room when the escapade of the burnt paper took place. or other ways. He died very lately a Judge in the East Indies and after arriving at the Baronetcy. of regret for “dear Eton”. He went very young into the Guards and was taken prisoner at Bergen op Zoom. married but died some years back at Dublin. prominent and, at times, controversial High Churchman. – minus the Logic-paper – before they were eleven years of age”. Edward was the more industrious”. methods he had learnt at his first school. 1824. Matriculated 1825. Served in Grenadier Guards. Died at Finchley after “repeated attacks of paralysis”. 1823 at Benares. Then returned to Cambridge, being admitted at Queens’ in 1828, BA 1830, MA 1833.
was the incumbent at All Hallows, Staining, Lancs, from 1851. Died at Mark Lane after a long illness. 47]) son of William Eden, first Baron Auckland of West Auckland. He was born at Eden Farm, Beckenham. 1854-1869. He died at Wells. Edward Geoffrey Stanley (see Note 62), also a student at Roberts’ academy (see Note 36). of her, wearing furs, which hangs in the Metropolitan Museum of Art, New York. 70 Lord William Henry Hugh Cholmondeley (1800-1884) second son of George James, Marquess of Cholmondeley. consider it the duty of a Conservative to refuse attention to claims for necessary reforms”. us with photocopies of two letters. 1869. “He abolished slavery, educated Ireland, and reformed Parliament.” Patron and friend of Edward Lear. ‘a leap in the dark’. Place for Nelson and Lady Hamilton. but I have never fallen in with him for many years. then, but my admiration lessened much subsequently. He was a good verse maker and was put high at Eton. of the day was watching him and that Lord Liverpool intended to bring him forward on the first opportunity. Eton for the purpose of educating her sons at that school. his age. He left extremely soon. I think Roberts could not get paid for him, and would not have him back. ten or eleven before he came and was not put much above me, in fact latterly I came to be in the same class. or perhaps less. Being however somewhat older he was placed according to age a little in advance of us. contented with rope harness but Exeter brought most exquisitely finished leather reins with bright buckles. fearful words could have created this violent burst of feeling. Brownlow, 2nd Marquess of Exeter, K.G. in Ceylon” (Monson). Charles Brownrigg married and died within a month in 1854.
and worse communications, many officers and men were killed, wounded or captured, and weapons lost. 1807 John, 4th Baron Monson, uncle to the writer of these Reminiscences. 54 Angelo’s. A house at Eton. to have been an excellent landlord. By way of recreation he enjoyed driving four-in-hand. Lord Saye and Sele, succeeding to the title in 1844 as William Thomas Eardley-Twisleton-Fiennes. and the species. In 1751 he published Philosophia Botanica, in Latin. 58 Rumble. The rear portion of a carriage, for extra seating or carrying luggage. at least the 17th century, associated with Cockley Cley, Flitcham, Anmer and Fring, all in the King’s Lynn area. held Fring Hall early in the 19th century. by Price’s emaciated form. The phrase is otherwise mysterious. 44 Pittite. A supporter of William Pitt, Tory prime minister May 1804 to February 1806.
to Peterhouse 1814, MA 1817. Vicar Studley, Warwickshire 1823-5; rector North Bovey, Devon, 1825-30. Died unmarried at Andover in 1830. Morton is missing in most of these books). Brother of Robert (Note 67). Eton and Christ Church. whose two novels and letters from India have been reprinted many times. son or a fellow commoner, because he wore a gold tassel or tuft on his college cap. Welbore Ellis, Viscount Clifden. Educated at Westminster and Christ Church, entered Parliament in 1818.
first Baron Dover in 1831 and died in 1833. A published poet and raconteur. Monson’s schoolfellow would only just have become second marquess at the beginning of these Reminiscences. Governor. I am not certain if he is alive. priority especially in the later ones. Philip Pusey,55 the son of Philip and Lady Lucy Pusey, was in after life the eminent Agriculturalist. runner, his figure was so lithesome and active. Mrs Roberts petted him. Roberts had little mercy for him. yet in little accomplishments he was extremely clever. He drew very nicely and painted our arms on shields. Lady Sophia Lennox, daughter of the fourth Duke of Richmond. He was MP for Stamford (a family seat) 18181832.
military steeplechase in Dublin. He died in London. Roberts’ academy (see Notes 4,31,41). 31 William Barlow. (See Notes 4,30,41) “Went to sea and died young” (Monson). 32 Henry Wellesley (1793/4-1866) illegitimate third and youngest son of Richard, 1st Marquess Wellesley. Matriculated 1811. Student (i.e. fellow), Christ Church 1811-18. He obtained his BA in 1816, MA 1818.
commentators or editors. ‘Variorum edition’ was the usual phrase. Hobart of Blickley and a baronet. He assumed the additional surname and arms of Hampden in 1878.
in the school” (Monson). Admitted to Trinity, Cambridge at age of 16 in 1816, but failed to graduate. might marry an heiress, Miss Capel, he seems to have died single. “Family home at Streatham. Went to sea. Navy. In 1822 he married Sophia Coussmaker, who became Baroness de Clifford in her own right. 42 William Nanson Lettsom (1796-1865) son of Dr John Miers Lettsom (1772-1800) a “physician of promise”. 17 William Meyrick. “Afterwards Colonel Meyrick” (Monson). September 1813, after a short illness, and was buried in the Wade family vault at Boxford. 20 Presumably Beddington Park House, although it is not usually claimed that Elizabeth was imprisoned there! 21 Now known as Tooting Broadway. Duke of Bedford, and brother to the fifth and sixth Dukes. He had been born five months after his father’s death. was a fourth son, yet another William (1800-84). 26 Non redolet sed olet qui redolere solet. Might be translated: He stinks only to him who himself stinks. 27 Francis Russell (1793-1832), the eldest Russell brother, went to Christ Church, matriculated in 1810 aged 17. He became a lieutenant-colonel in the army, and MP for Tavistock (a family seat) in 1831. He died unmarried. attractions whiskers of dimensions hitherto unknown”. a Privy Counsellor in 1841. He owned one of the largest racehorse studs in the country and bred many winners. His death, at Burghley House, was marked by many obituaries in the sporting press. in Albemarle St. Price said this with a cynical sneer to show how wealth would advance even stupidity. such an uproarious applause that the piece was saved. recollection that his classical attainments were not surprising. talent but both the Puseys were forward of their age. brothers had also been at Roberts’ but he was the only one I knew then. I think he died early in life. phraseology, they both being of the younger ones nice runners. but he is now Bishop of Bath & Wells. games in the play field. Cholmondeley House and he was always glad to see me. We have not met for years. but too ill to see us and died without ever recovering sufficiently for an interview. She was then above 80. Frederick had lived a fast life and been many years dead. 7 Usher. An assistant to a schoolmaster or headmaster; an under-master, assistant master. 11 Chesnut. An earlier spelling, which disappeared in the course of the 19th century. on Philip’s death. That title then went to a cousin. 15 Charles Cuyler (1794-1862) was the elder son (see Note 16) of General Sir Cornelius Cuyler, Bart. of Welwyn. at Eton and Marlow (Note 34). Chief of Police, Dublin” (Monson). Cosway. Otherwise nothing seems to be known of him. and fine colouring. Having left Scotland for London in the 1820s he exhibited for many years at the Royal Academy. William becoming Vice-Provost in due course. Directory 1826-7 lists “Revd. Richd. Roberts – gentlemen’s boarding academy”. 1818. Died in Cadogan Place. father as second Baronet in 1846. He married a daughter of the governor of St Lucia, by whom he had three sons. He died in Hanover Square in 1857.
his kind protectoress could no longer support and about 1825 I knew he was in the Debtors Jail at Dover. What became of him subsequently I know not. I regret much to find how few actual passages in the lives of my schoolfellows I can now call to mind. and it is in this, that no doubt lapse of time has dimmed my memory. and his usefulness was certainly more apparent in supplying us with hoops. I suspect all he saved from the wreck of the Revolution and of which no doubt he was somewhat proud. past eleven. I do not think I ever saw Mons. Le Tailler after I left Mitcham. of course Penmanship was a principal part of the education. book used to excite our intense admiration. was due to the trust and confidence he inspired in the Chinese with whom he did business – a rare accolade. became Deputy Lieutenant of Lincolnshire. was not a success, and a separation followed. he died, with his own explanatory text in English and French. Lord Monson’s tastes continued to be for study and research, in which he was aided by his excellent memory. published work developed from the notes begun on honeymoon to become Lincolnshire Church Notes 18281840.
restorers destroyed so much of their fabric. They have been recently reprinted. and, since 1949, on deposit in Lincoln Cathedral Library. aged 66, on 17 December 1862 at the Great Western Hotel, Paddington, on his way to Torquay, for his health. was making this increasingly likely. William John Monson, afterwards 6th Baron Monson, 1826. Lincoln Record Society and Lord Monson. of prepostership was not only a choice but a necessity. will understand the horror of undergoing it amidst the awfully strict dull discipline I have described. remain more faintly coloured in my memory than those preserved by the tenacity of childish impressions. patriotic than cautious of those deputed to receive her that these fogs seldom lasted more than a few days. The horror of the poor man may be conceived when week after week elapsed without any sign of change. [illegible word] Brown among the number could not begin to keep term for a long time after. I still look back to that illness with more of pleasure then dislike. disagreeable time but the supplies were rather scanty as I did not feel really very ill when my foot was rested. greater exposure to cold we then underwent. afraid of the consequences but they passed through him very quickly without any evil consequences. sending us all home which, however, it was not serious enough (I am afraid to our sorrow) to do. handsome dashing man. I have an idea he subsequently married a widowed Peeress, I fancy Lady Antrim. brought me some cakes and other schoolboy valuables. while it lasted. The last three months were comparatively more endurable; that is all. was at school with the wretched Cole. My bed had the head against the East wall and under the window. The south-east elevation of the Revd Roberts’ Academy as it appeared in the sale particulars of 1841. As Glebelands the building survived until 1993.
from the Garden side. It was very easy to recognise how all the rooms were and yet the alteration is great. The Stable yard seemed little altered but the back garden was planted with shrubs and quite changed. it seemed just as it was 54 years ago. understand, a name I never recollected it to have but I think it has been purchased from the Living. playing field and I was on tenterhooks to see if the well known House was in existence. There it was! windows. I also did not discover the gate across the field. We drove to a new Inn97 that was quite close. no school but the House divided and inhabited by two families. no drive in. Mrs Roberts walk still existed in the Play field. H H small closets extending G E Mr.
course now open the other way and are the only interesting remains in this portion of the House. I left Mitcham finally in March 1809 and wrote nearly my first copy of English verses on the occasion. That slaughter threatened Ithaca’s wise chief. To leave his wife, his friends and all that’s dear. Or quench my thirst in the transparent wave. Or tired with sports to sleep my body laid. The greatest joy is in a Tutor’s praise. When Eton’s towers claim my studious way. Adieu thou shepherd of my early years. Ah gratitude alone can thee repay. A friend, instructor, Parent all in thee. On this Mr Roberts returned the following reply to the Valete et Plaudite. While fiction prompts and fancy guides the lay. List to the counsels of an early friend. Shaped every infant thought and strung your lyre. The taunting jeer, the scoffing tongue despise. Direct each action, influence every thought. The vestal flame that ne’er shall cease to glow. Where honor and sincerity combine. And imitate its bold but bright career. When noble Talent, nobler virtues grace. And let the Gentleman be always seen. Midst earlier scenes of Youth remember me. My card shall say to you I am at home. Mrs Roberts was then dead but Roberts had married again. Of course I had no interest in the second wife. season (it was probably June) to go to a Ball. George Dallas died from an accident out shooting on 14th. in the Gents. Mag. of 1815. Mrs Roberts was buried at Boxford, Suffolk. of Rail to the Village, yet I preferred to approach it by the old high road. This entry was posted in Publications, Local History Notes and tagged in late georgian mitcham, lhn, mitcham, Reminiscences.